About a week ago, I wrote a post about making kitchen resolutions to learn new skills and techniques during 2012, along with an invitation for any other inspired cooks out there to join me in doing the projects. After many interested e-mails, I’m happy to officially commit to 12 months of kitchen resolutions, nicknamed Cook it! 2012. Every month is a new project. I have little or no experience in some of the techniques I’m going to focus on, but I really like eating all of the foods I’ve jotted down on my list, so I’m hoping to learn how to cook all of these things at home. There are a couple techniques that I’ve got on the list that I already have experience doing, but I want to get to a more advanced level with them. At the beginning of the month, I’ll announce what the project is, and post recipes, pictures, and instructions I’ve found helpful. If you want to cook along with me, you’ll have one month to tackle the resolution in your own kitchen. Cook something in the same category that I’ve made, but not the same exact dish. If you have a blog, write a post detailing what you made along with any pictures and recipes you want to share. Before the deadline, e-mail me (thejamgirl@gmail.com) a link to your post and I’ll write a little roundup of everything. If you don’t have a blog, you are absolutely, 100% still invited to participate. Instead of e-mailing me a link to a post, just e-mail me a picture of what you made and I’ll put together a photo gallery of everybody’s work. There’s no need to cook every single project if you don’t have time, so no stress about that. Just have fun. If you’re going to participate, e-mail me with your blog url (if you have one, or e-mail address if you don’t) at thejamgirl@gmail.com by January 31st to join. The deadline for this project will be February 15 at 12:00 PM (PST). All that being said, I think it’s about time to get to it. So, you know that stupid face that so many of the cooking show hosts make when they finally taste what they’ve been making? The face that’s like “…oh, yeah baby, eating this grilled chicken makes me feel like I’m licking Ryan Goslings abs!” It’s ridiculous. And usually what they’re tasting is something really mundane that definitely doesn’t look like it should be inspiring those fluttering eyelashes and throaty moans. I’ve been wanting to learn how to make pasta forever, and really just needed to spring for the pasta machine. I was worried that it would just be another appliance that sat around the kitchen gathering dust, but after that first bite of noodle glory, I can guarantee that it will see plenty of use. The machine I got is an Atlas, which worked like a charm. There are a variety of pasta-makers on the market, and this is on the lower end of the price range, around $60. (I don’t have any opinions on other models since I haven’t used them). They seem to come in all shapes and sizes, including really fancy ones that attach to kitchen-aid mixers so you don’t have to do any of the hand-cranking that this model requires. Most of the machines follow the same pattern, where you make the dough first and the machine does most of the actual work of kneading, stretching and cutting the noodles. This is adapted from a recipe in Deborah Madison’s Vegetarian Cooking for Everyone, which has a really helpful section about making fresh pasta. Make a well on the counter with the semolina flour. 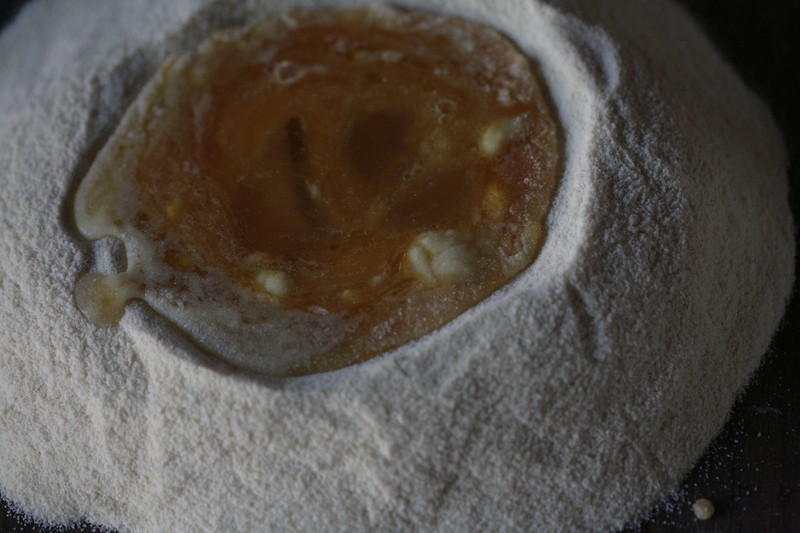 Put the eggs, oil, and salt into the hole in the middle of the flour. Use a fork to break up the yolks and start stirring everything together, gradually pulling in the flour from the edges of the well. Bring in as much flour as you can with the fork, and then start kneading together everything with your hands. 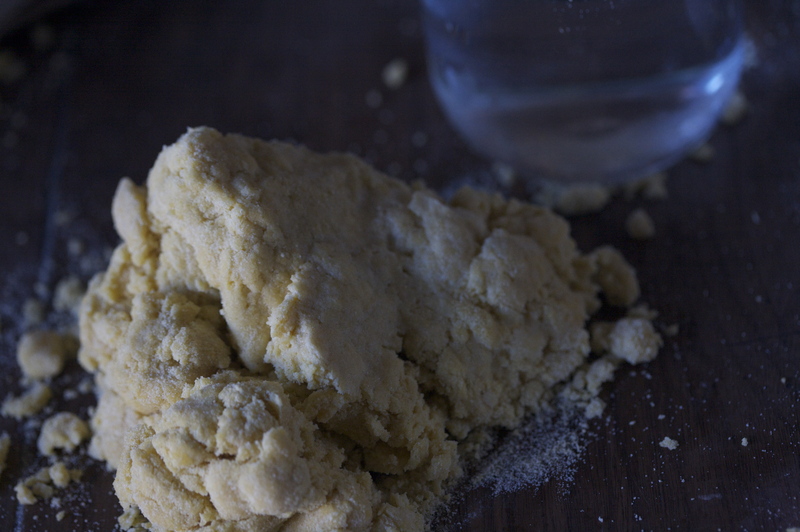 If the dough is dry and won’t come together, add in a teaspoon of water at a time and keep kneading until it forms a ball. If the dough is too wet, add some flour. Once the dough forms a ball, knead it for another 3-4 minutes. Cover, and let rest for 15 minutes. Continue according to the package instructions with whichever machine you use. 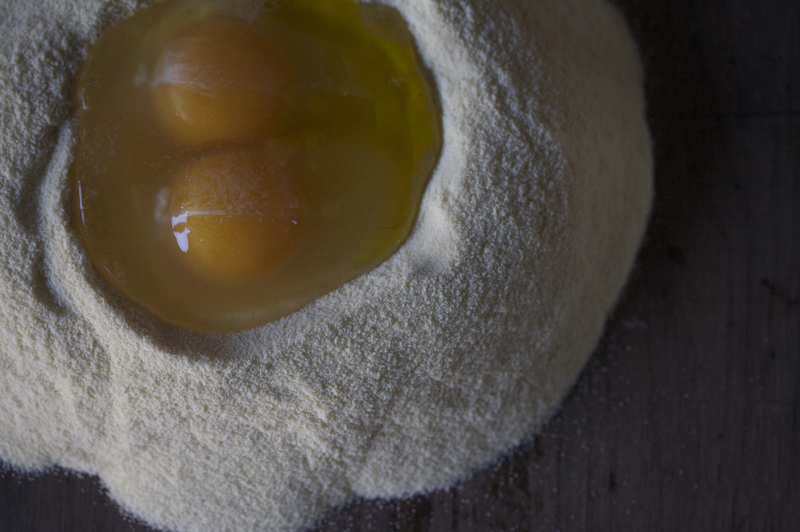 For more visual people: Use a fork to break up the yolks and start combining the flour into the egg mixture. It helps, after mixing with the fork, to stick your hands right in the flour and egg mix to gather everything together. This was the point in my recipe where I realized that farm eggs don’t always come in the traditional “extra-large” sizes that recipes often call for. There definitely wasn’t enough moisture from my Medium-Largish size eggs, and my dough was quite dry and crumbly. I just added a lot more water than the recipe called for in this next step, which didn’t seem to matter. Next time, I’m going to try adding an extra egg so I don’t have to use as much water. 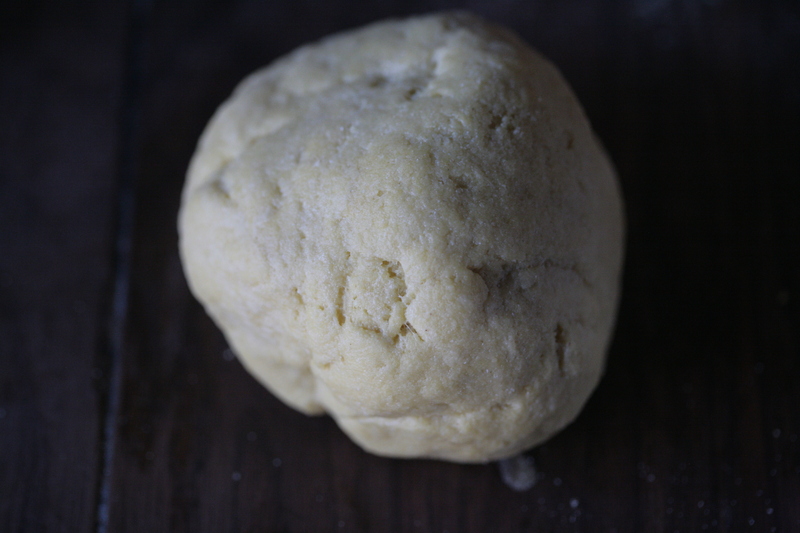 To get the dough into a ball, just keep kneading it together with your hands. (It should be fairly dry and not stick to your fingers at all. Add some flour if it does.) Knead the dough for a few minutes to make it pretty smooth, then form it into a ball and let it rest, covered, for 15 minutes. 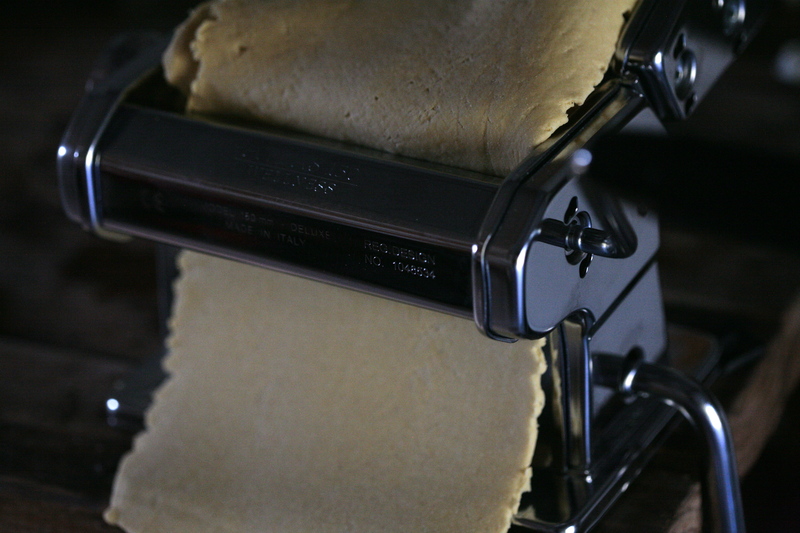 Once it’s done resting, roll the dough out a little to help it fit into the pasta maker. After this, it’s just a matter of following the instructions for whatever pasta maker you have. The Atlas that I own has you repeatedly feed the dough through an opening that flattens and thins it out into a long sheet. My dough wanted to fall apart a little bit when I first started, but I just kept folding the sheet in half or thirds and feeding it through the machine. After a few turns through the rollers, it started holding together nicely. Eventually, the dough gets to the proper thickness for the noodles. 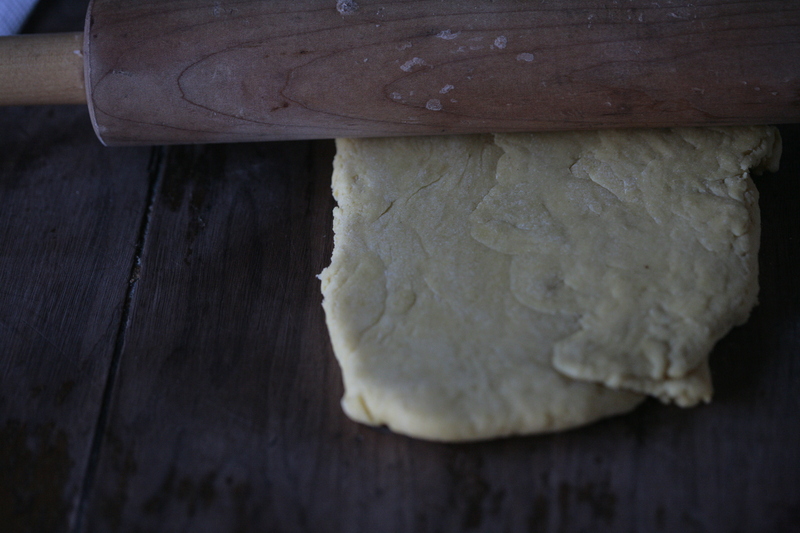 Cut the long strip of dough into 10″ lengths. Use a knife to cut wider noodles like pappardelle or tagliatelle, or use the cutting attachment on the machine for thinner ones. 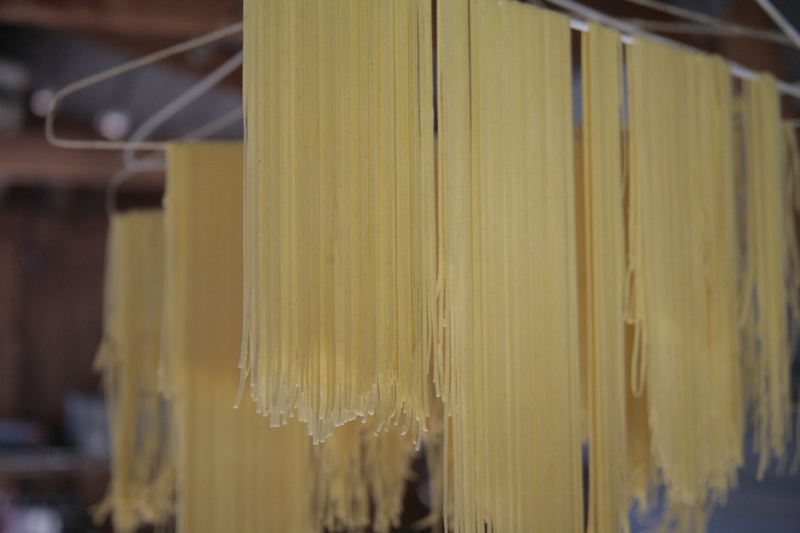 Hang the noodles to dry for an hour or two. I used hangers instead of a real pasta drying rack, but you have to cut them on one side with wire-cutters so the pasta slides off without breaking. 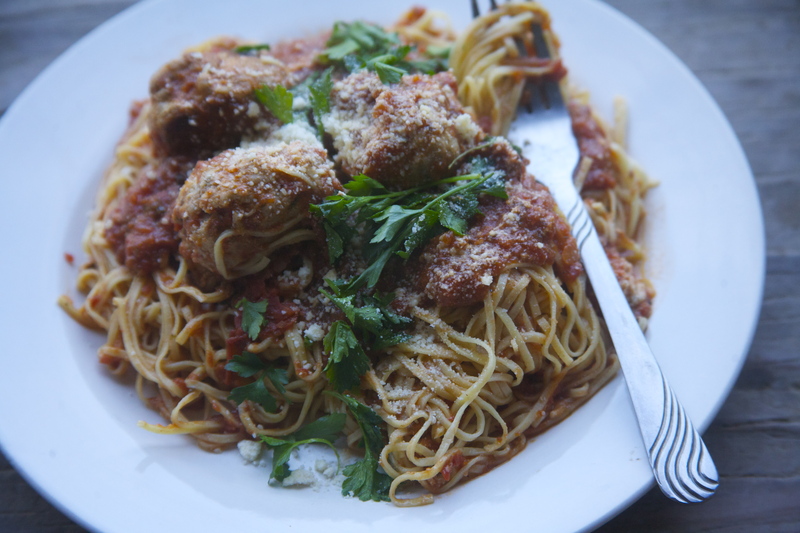 To go with the spaghetti, I fancied up some canned tomato sauce from our summer garden and made meatballs vaguely inspired by Saveur’s recipe here. First, make the sauce. In a large pot, heat the olive oil over medium high heat. Add the onions and garlic and saute until they’re translucent. Turn the heat up to high and get the pan really hot, then pour in the red wine. Add the crushed tomatoes, parsley and bay leaf to the pot and bring everything to a simmer. Turn the heat to low and cook until thickened. If you like smoother sauce, puree with whatever appliance you own to puree things like this- blender, food processor, immersion blender. Season with salt and pepper to taste. Now, make the meatballs. 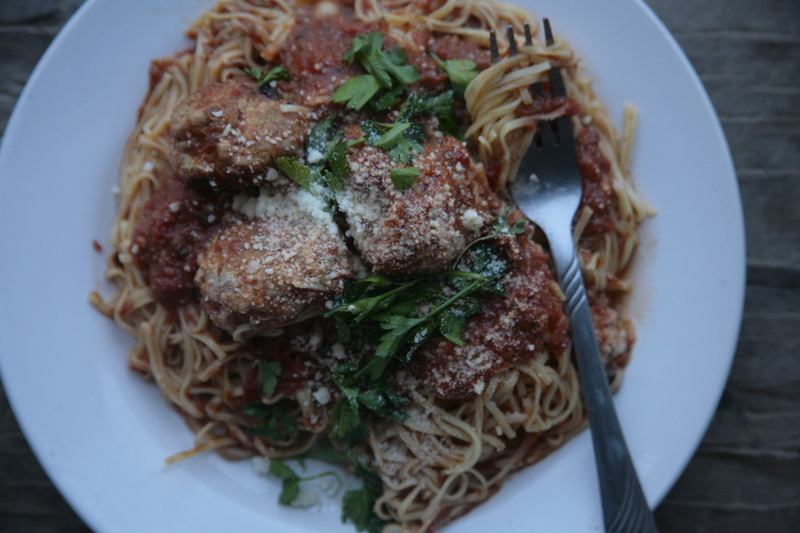 Combine all of the meatball ingredients except the olive oil in a mixing bowl. Gently work everything together. Form the meat into whatever size balls makes you happy. 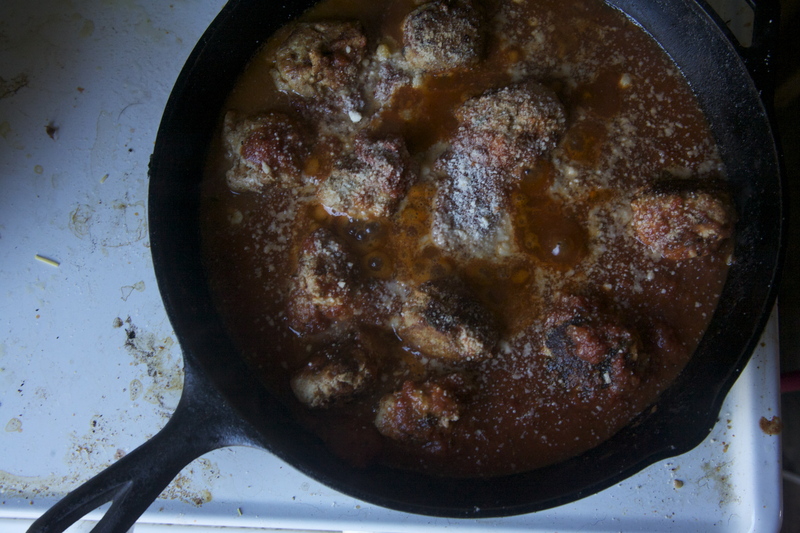 Heat up the olive oil in a skillet and brown the meatballs on all sides. Pour the tomato sauce over the meatballs and simmer for about 30 minutes to cook the meat all the way through. Cook the spaghetti in a pot of liberally salted boiling water. The fresh spaghetti cooks up in a matter of minutes, so make sure not to overcook it. Drain, and combine with the sauce and meatballs. Garnish with cheese and parsley and serve immediately. 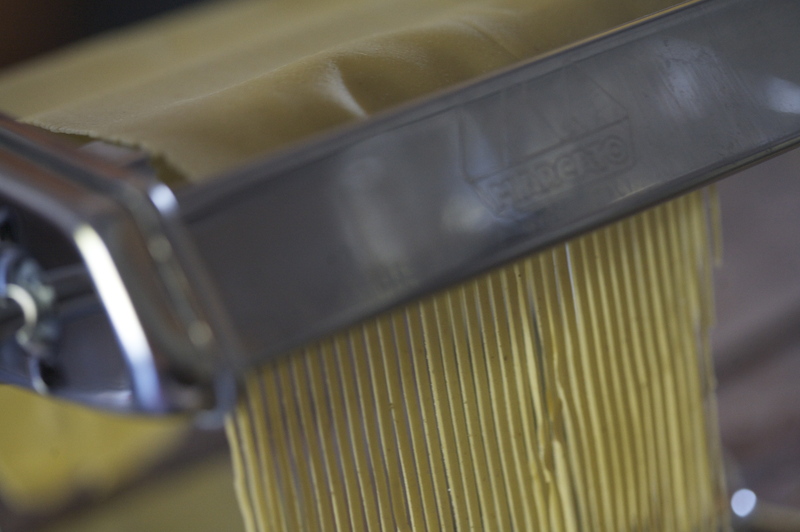 One last note: If you want to do this month’s resolution, you don’t necessarily have to buy a pasta maker. There are a lot of recipes that don’t use a pasta maker that I have bookmarked to try, like the Roasted Garlic Orechiette from Well Preserved, Pumpkin Gnocchi from Local Kitchen , or maybe these homemade egg noodles topped with beef stew or a mushroom stroganoff. I still remember the späetzle I ate in Munich thirteen years ago, and you definitely don’t need a pasta maker for those. (Drenched in a rich, meaty brown gravy, this might be the recipe I need to recreate at home next. They were amazing). Happy Cooking! Remember, carbs don’t count if they’re completely from scratch. Excellent first challenge and one that I have not tried. If I can get some time (I am travelling a good bit this month), I would certainly like to have a try at some gluten free alternatives. I’ll keep you posted. Thanks for the inspiration! OK – seems I need brown rice flour (check), gluten substitute such as guar gum or xanthan gum (check) and tapioca flour (hmm don’t have that) and then recipe is same as yours with the addition of an extra egg yolk. I too will have to use hand shaped pasta or hand cut noddles as I don’t have a machine. I am so excited to do this! Your pasta looks gorgeous! 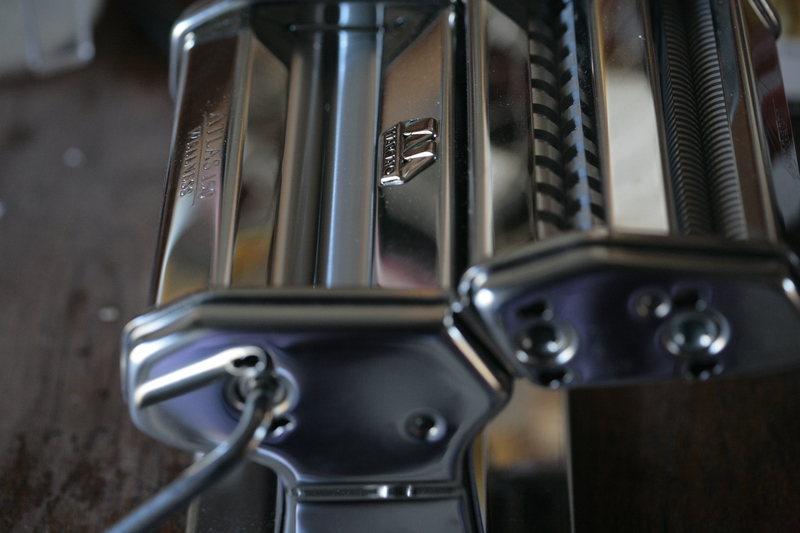 My new-ish pasta maker is an instrument I’ve been meaning to tackle so that I don’t have to think about to use. The chickens are laying again so I’m in luck! Thanks for hosting! What a great idea! Pasta has been on my list for a long time, but I don’t have a roller. I guess I have an excuse to buy one now. Count me in. vonnie- I hope you cook along! I would love to hear about gluten-free recipes. local kitchen- thank you thank you! that link is excellent. grow and resist- I’m glad you joined! I love seeing what other people make, it can be so inspiring. I’m definitely in for THIS challenge! I don’t have a pasta machine but I’ve found some good alternative techniques that I will try this weekend. I don’t have a pasta machine, but I’m going to try ravioli! I’ll take pictures as I go along. I am trying to email you at thejamgirl@gmail.com and my email isn’t going through to you (several attempts). Is there some other way I can sign my blog up for the challenge? pickledblogger- I’m excited you’re joining, I can’t wait to see the ravioli pics! Just sent you a link to my “entry” (to both your email addresses, just in case) — it was so much fun! I’m looking forward to February’s challenge already. Tried making homemade pasta once and failed. I really want to do this so I’m up for the challenge of trying it again. This time I’m gonna try it with my kitchen aid pasta maker attachment. Will keep you posted! Great post – so funny about the stupid face thing… but when the food’s THAT good, what else can you do?